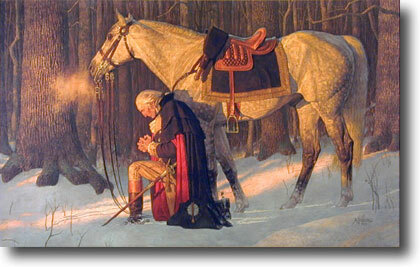 "The Prayer At Valley Forge"
"THE PRAYER AT VALLEY FORGE" is a popular painting by Arnold Friberg, RSA, in celebration of our country's 1976 bicentennial celebration. The words on the brass insert were spoken by George Washington as he resigned his commission as general of the Continental Army on December 23, 1783. "I consider it an indispensable duty to close this last solemn act of my official life by commending the interests of our dearest country to the protection of Almighty God and those who have the superintendence of them into His holy keeping." Arnold Friberg is one of the enduring biblical artists of our time, recognized as such by some of the most legendary names in the world of art and entertainment. He diligently researches his subjects so they are historically authentic, yet encompass a spiritual force transcending mere historical accuracy. His work encourages Christians to respond to the message of the Bible... real men and women, in real places, in events that actually happened. $95 - 16.5" x 21"
$225 - 21" x 30"
$99 - 21.5" x 31.5"
$499 - 19" x 31"
$599 - 26" x 36"
$225 - 28" x 36"
$325 - 28" x 36"
$495 - 30" x 39"
"I consider it an indispensable duty to close this last solemn act of my official life by commending the interests of our dearest country to the protection of the Almighty God and those who have the superintendence of them into His Holy keeping." " If my people...shall humble themselves, and pray, and seek my face...then will I hear from heaven, and will forgive their sin, and will heal their land." secure ordering page that contains more details. and send us your comments. Thanks. © MMVI, The GOOD BOOK Company, all rights reserved. 302 N. Washington Ave., Centralia, WA 98531, U.S.A.